Moyvane is located in North Kerry just off the main N69 road – 7 miles from Listowel and 5 miles from Tarbert. No reference on Moyvane is complete without a listing of the myriad townlands that comprise the whole parish of Moyvane and also that of its sister parish, Knockanure. 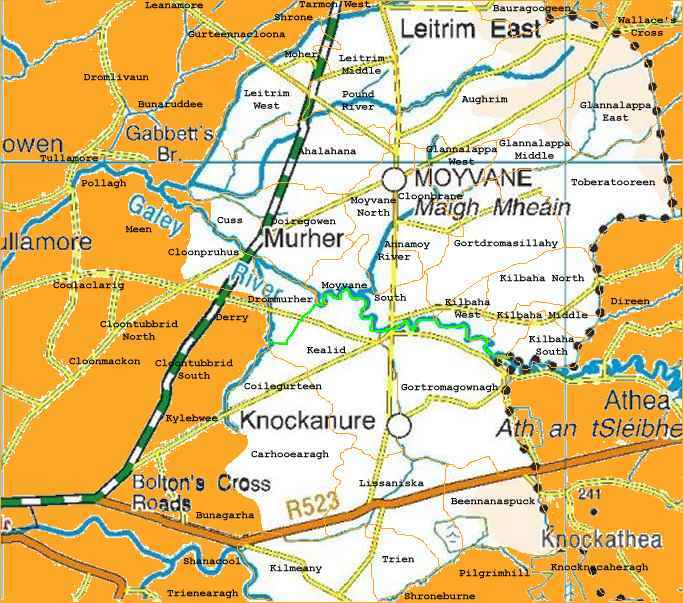 Note: Above the ‘green’ line is the civil parish of Moyvane, and below it lies the civil parish of Knockanure. These two great North-East Kerry parishes are divided by the Galey River, a tributary of the Feale, and both straddle the West Limerick border.